"However it was not enough, because Geschke was very strong today. I would have needed an amazing condition, but today was not one of those days." After Lampre-Merida spent a happy rest day thanks to the victory of Rubén Plaza in Gap, the Tour de France riders were back on the roads for the 17th stage which had been already covered in the Critérium du Dauphiné 2015. The riders started the stage with a battling mood since the early kilometers were characterized by many attacks. For Lampre-Merida, the two best riders were Rafael Valls and Kristijan Durasek: the Croatian was 2nd in the summit of the first climb, then the blue-fucshia-green duo was in the breakaway which escaped on the second climb. Durasek counterattacked with Pauwels and Herrada on the third climb but the action was neutralized. Later, it was Valls's turn to try to make the winning move, chasing the German counter-attacker Geschke. 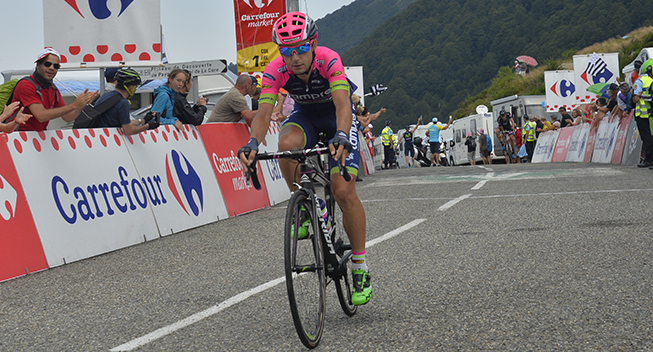 Valls could not join the attacker (who won the stage) and he completed the race in 19th while Durasek was 53rd. "It was necessary to spend a lot of energy to be in the main breakawaybecause of the many attacks which characterized the early kilometres of the race,” Valls said. “I had good feelings and I could rely on a teammate, Durasek, in the breakaway; however it was not enough, because Geschke was very strong today. I would have needed an amazing condition, but today was not one of those days."